I’m always looking for fun ways to review course content with my students! Today, we reviewed vocabulary from last semester using Quizlet Live which is always super fun. Read more about how we use Quizlet Live here. 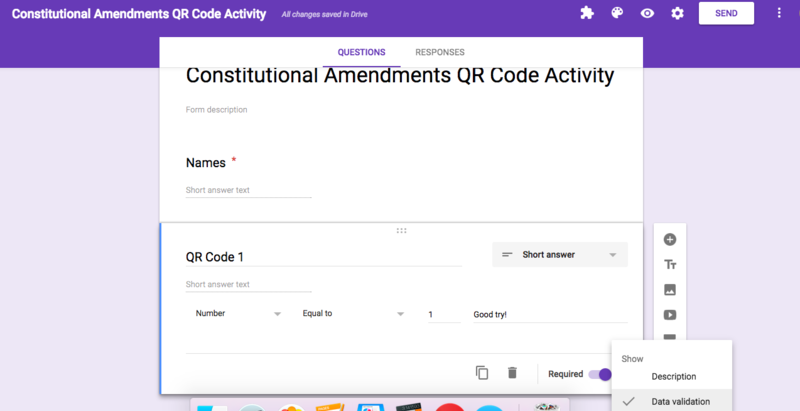 Today, I was thinking about a different review game to try and I thought, why not smash together two of my favorite EdTech tools …QR Codes and Google Forms! I love QR Codes. 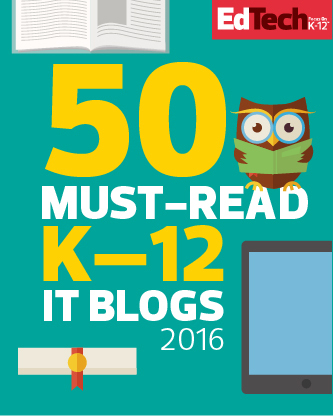 They’re easy to make, easy to use, and provide a fantastic way to share information with students. 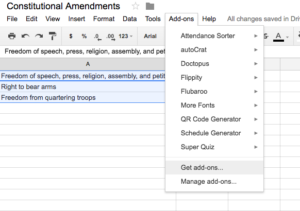 I also love Google Sheets … especially the add-ons and formatting options! And, wouldn’t you know there’s a QR Code add-on in Sheets! 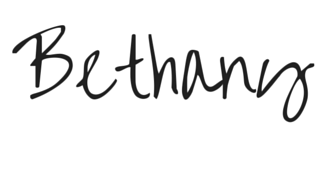 It’s fabulous and so easy to use! 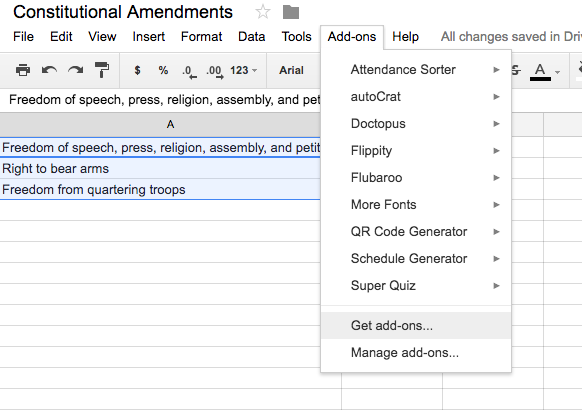 Simply open a new Google Sheet, click the “Add-Ons” menu, choose “Get Add-ons,” and browse away! To create QR Codes from Sheets, simply search “QR” in the search bar on the “Get Add-ons” menu. Next, add definitions (or anything really) to a column in your sheet. I would suggest including a number in your description (ex) 1. this amendment abolished slavery) to prevent confusion in your QR Code. Then, select “QR Code Generator” from your Add-ons menu and click “start.” You’ll see a box on the right side of your screen with many options. To create the QR Codes for each cell, simply highlight the cells and select “generate.” You’ll notice a progress bar as the add-on gets to work! When it’s finished, select “open document,” and you’ll see your QR Codes on a Google Doc! Rename the Google Doc to save your sanity in your Google Drive. Print the document, cut out the QR Codes and post them throughout your classroom or your building for a fun scavenger hunt! I also love Google Forms. They’re just simply fabulous. 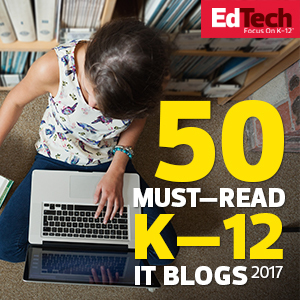 For this activity, you’ll create a Google Form that uses data validation to require students to enter the correct term before submitting the form. I’ll be using this activity in the coming weeks with my students! Here’s a brief instructional video for creating this activity! Thank you for sharing information about the QR Code creator in Google. 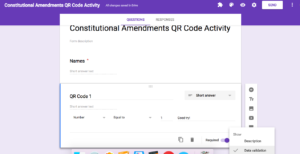 How do you create data verification in Google Forms? I had no idea Google Sheets has this option, it’s awesome! I usually generate QR Codes like this: http://www.coreldraw.com/en/pages/qr-code/index.html but as well as you, I also really like using Google Sheets, so I definitely have to try this trick! Thanks for sharing! Thanks for your comment! Google Sheets is AWESOME! I love QR Codes and creating them through Sheets is a breeze!